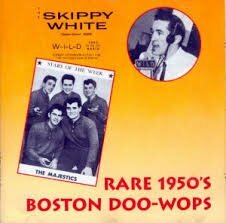 Over the past several decades no radio station in Boston had a more lasting unchanged format or a more trusted voice in the community than WILD AM 1090 did. The daytime-only station, located at the time in a small brick building on Warren street across from Roxbury District Court, ascended to prominence in the late 70’s and through the 1980’s under the ownership of Boston entrepreneur Kendall Nash. From upcoming concerts to community related information if you wanted to find out what was going on in the city, am109 was the source. With a full output signal of only 5000 watts, the station reached out to the neighborhoods of the city but also could be heard in some suburban communities as well, allowing listeners outside the city to enjoy and share in the stations urban contemporary format that frankly could not be heard anywhere else. 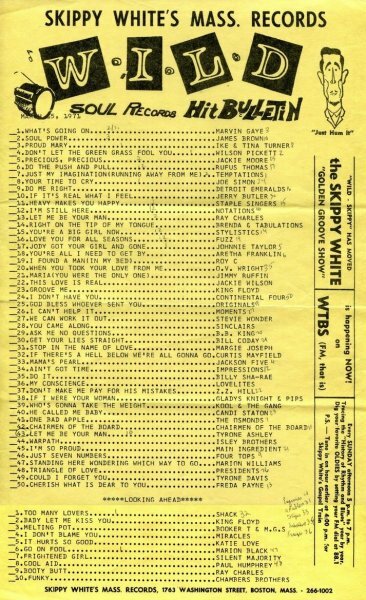 The music and the artists WILD played showcased R&B, soul, and funk groups neglected by other media outlets — embracing the genres and delivering the goods to its appreciative listeners on the other end of the radio. A number of respected Boston broadcasters weaved their way through WILD over the years. 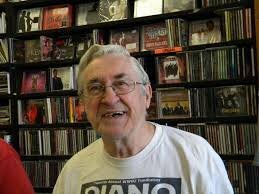 Jimmy Myers and Willie Maye among others, hosted shows at the station for many years and Boston record store legend Skippy White was a disc jockey at am109 years earlier in the 1960’s. 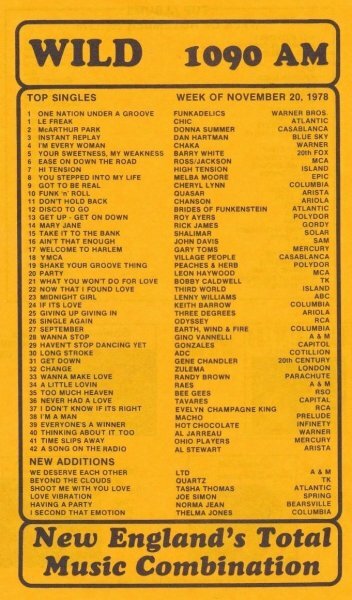 Boston magazine voted WILD’s morning show the best in Boston in 1985 — an amazing accomplishment for a station a fraction of the size of its competition. 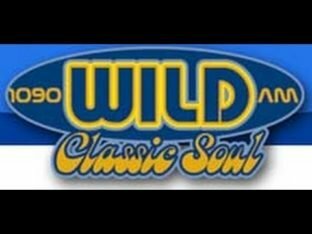 WILD’s ability to bring R&B and soul acts to Boston was a major contribution to the city and one of its greatest services to the community. Concert promoters would contact the station to get the word out about an artist and advertise upcoming shows at local venues. The station was the city’s media outlet for the genre and was responsible for promoters booking acts and bringing artists to town that would not have played the city otherwise. 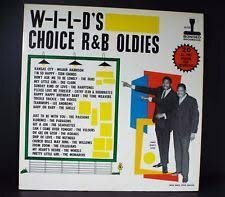 WILD helped promoters bring Luther Vandross, Parliament, Bobby Womack, and Slave to town, just to name a few. Giving everyone the opportunity to see and hear great live performances in their backyard was the stations real gift to its listeners. 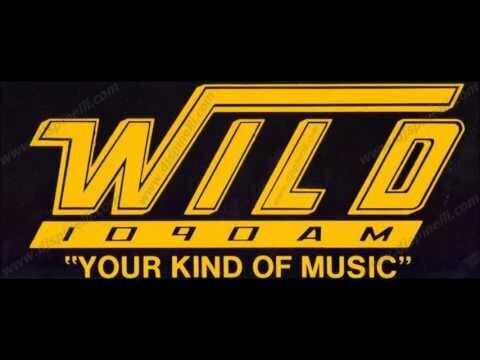 Going the way of so many small stations, WILD became part of a corporate radio media conglomerate in 2000 and lost its local ownership, format, and all ties to the community. During the station’s run it was the heart and pulse of the city not to mention the soul. The station was gradually stripped of its identity and controlled by outside interests. 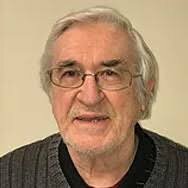 In the end we lost more than a radio station; we lost the music, we lost the familiar personalities, and probably most importantly we lost that sense of community and familiarity relished by the station’s loyal listeners for so many years.